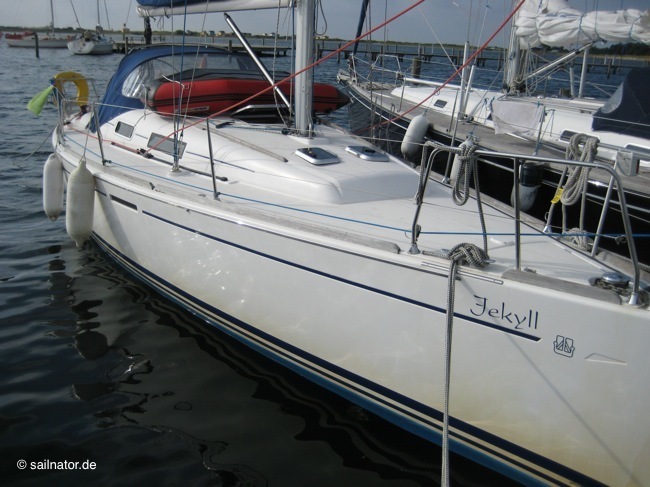 We sit well rested at breakfast in the cockpit of our charter yacht “Jekyll” in the modern marina of Sonwik nearby Flensburg. 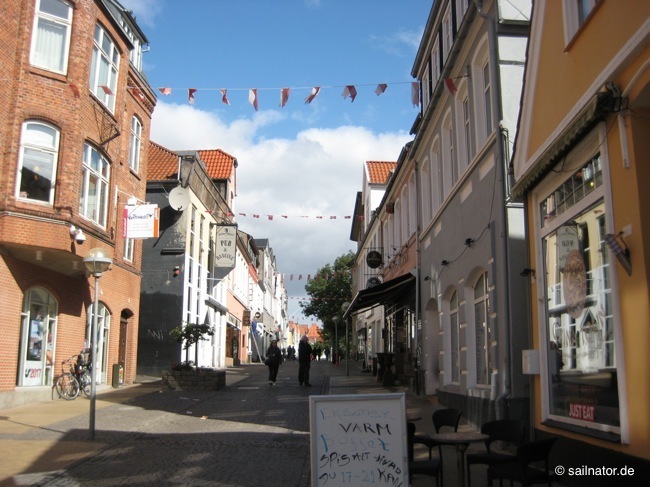 We are looking forward to our short trip to the Danish South Sea. We already checked the equipment when we arrived yesterday night. Now we wait for the delivery and the briefing by the charter company. Everything happens as scheduled and in a professional way. We go shopping in the nearby supermarket and are ready to leave the dock at about 01:00 p.m.
Unberthing from the floating jetty is unfamiliar but works by the first try. Outside the harbour a pleasant sailing wind blows with up to 3 wind forces. So we soon hoist the sails and push through the Flensburg Fjord. After passing Cape Holnis we reach the outer Flensburg Fjord. The sky is cloudy with blue spots in between and it is warmer than average for this time of year. We glide along little villages and enjoy the view on the high coast on starboard. 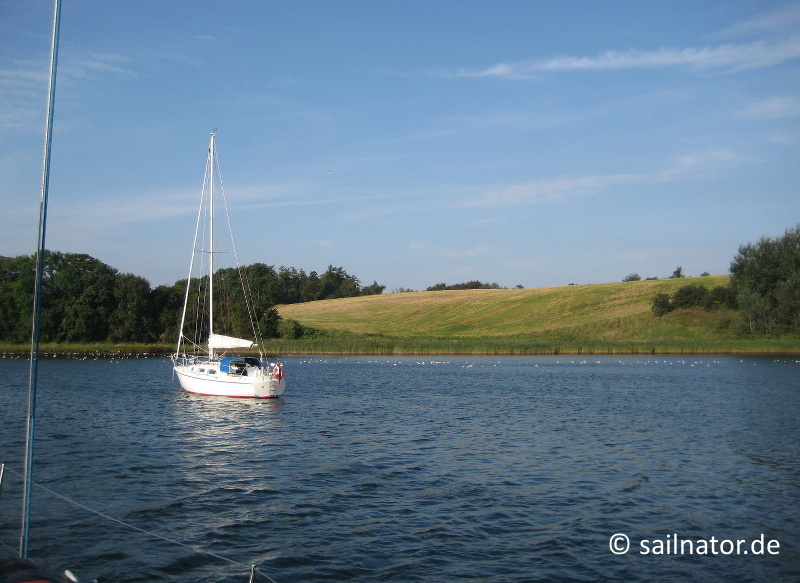 On port side the rolling hills of Denmark pass by and in front of us the Baltic Sea opens at the end of the fjord. We are four people on board. The skipper, me and two boys who just finished school. Both try to tap the full potential of the boat. The next days they will be only satisfied when it really rumbles and the yacht heels till the water reaches the winches. Gentlemanly sailing is not accepted. At about 05:30 p.m. we secure the sails in front of Sonderborg and drive by engine into the city port. The bridge behind the harbour is still closed. It blocks our way into the Alssund. But we only have to turn laps for about 15 minutes. That is not so easy, because there are many anglers in small floating dinghies and their fishing lines criss-cross the harbour basin. One of them gets into the passage punctually at 06:00 p.m. and does not realise that the bridge is opening. Only the loud signal horn of the bridge master wakes him up from his hunting fever. Every waiting yacht wants to be first now and so we close our eyes and hope for the best. When we reach the Alssund we hoist our sails again. Meanwhile the sun has come out and the wonderful landscape is submersed in warm evening light. We look for an anchorage in case of not being able to reach our intended destination in daylight. But our fear is unfounded. We make good progress and secure our sails at about 08:00 p.m. in front of the Dywig-Bay. The entrance is a little bit tricky but we pass it without grounding. In the last light of the day we drop the anchor. There are only 4 other yachts around us. The anchor holds and so we can prepare dinner and let the day fade away with a well-earned beer. We are woken by bright sunshine and enjoy the view on this wonderful anchorage. Swarms of seagulls and goose sit on the water and cows graze on the surrounding hills. The yachts swing in the calm morning wind that blows the sand out of our eyes. The boys appear on deck in trunks and jump head first into the water from the stern. Even our skipper lets himself get carried away to take a bath in the cold waters. I rather watch the spectacle from deck and guide the swimmers around the fire-jellyfish from up above. After an extensive breakfast we lift the anchor at about 12:00 p.m. and leave the bay by engine. The wind is blowing with two to three forces from southwest. At the narrow exit a folkboat beats in front of our bow. We have to wait till they have fought through while we drift starboards. Close to us seagulls stand in the water that even qualifies as knee-deep for them. Finally we can hoist the sails and at about 01:00 p.m. we already pass the northern shoals of the island of Als. Unfortunately the sun disappears under grey cloud-cover during the trip. But the mood still stays good, because it does not get colder and the wind still blows moderately from southwest. Because of the small swell between the island and a handy patch behind my ear I fortunately do not get seasick, but a little bit tired. At about 03:30 p.m. we pass the northern tip of Lyø. Far away we see some yachts and the ferry that runs between the islands. 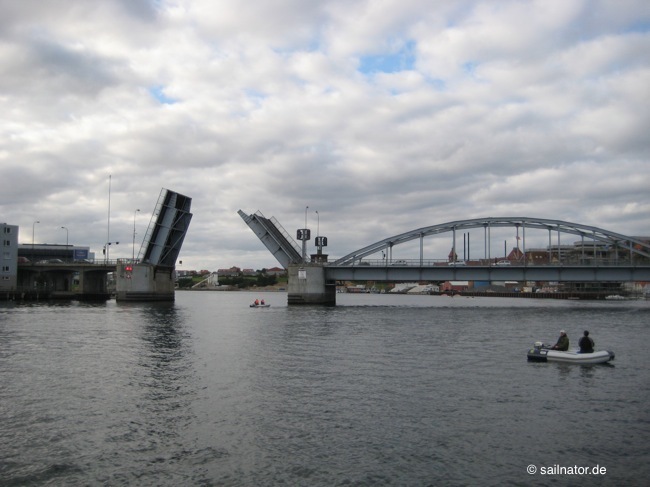 At 05:00 p.m. we reach the Svendborgsound that we can sail up to the bridge where the lateral seamarks switch. We secure the sails just in front of the harbour. Unfortunately there is only a berth for us windward of the floating jetty and we will be pushed onto it. We only can hope that the fenders will not squeak too loud during the night. This evening nobody feels like cooking. 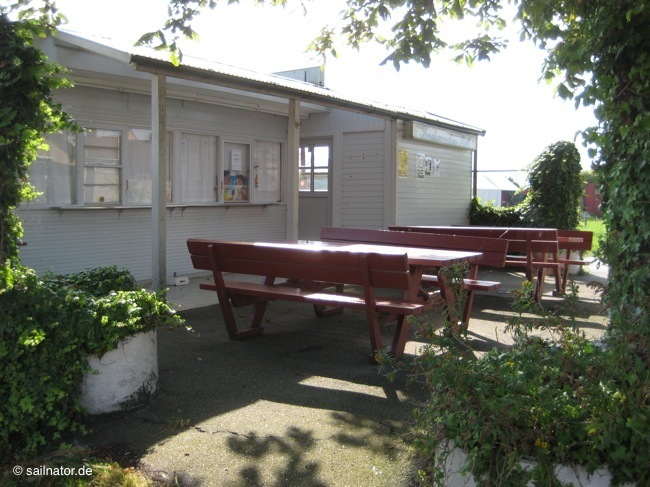 After we cleared the deck we go to the nearby fish and chips shack. It is getting dark early but we take a little walk into town. 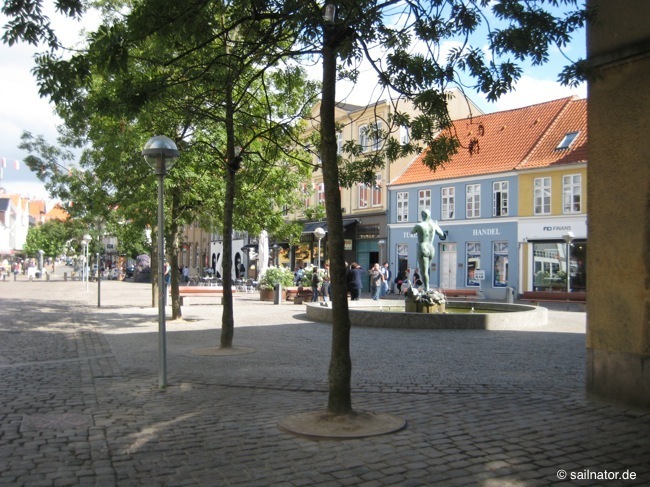 But Svendborg is deserted on this Sunday night and so we soon sit on deck again. We ensure that some of the liquid ballast from our bilge disappears. After yesterday’s boozy evening the waterline of our yacht is much better to see today. It takes some time till we are out of our bunks. And even after breakfast we are still not very well. So we sail only a short distance down the Thurø sound after we left the dock at about 11:00 a.m. We anchor in the Thurø bay after we passed the tricky entrance. The sun shines, the crew takes a swim and again I guide them through the fire-jellyfishes. They are pushed into the bay by the westerly winds. After having lunch in the cockpit we want to explore the shore. Till everybody is crossed over some time goes by because our inflatable dinghy only takes three men and we have no engine for it. At about 03:30 p.m. we lift the anchor and hoist the sails in the Thurø sound. 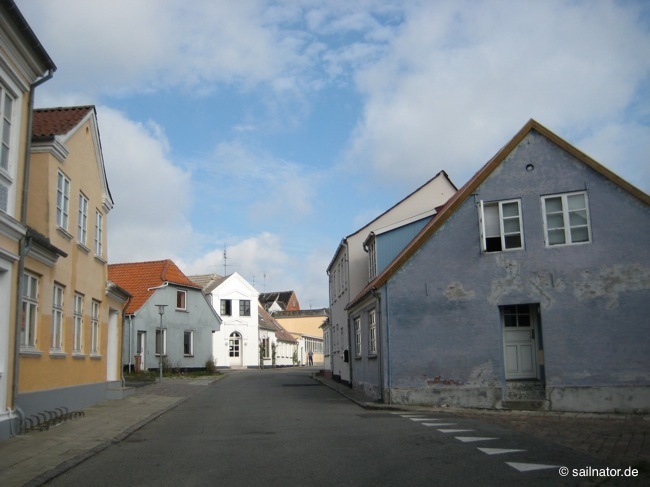 We head to Rudkøbing on the island of Langeland. The wind now turns to south-westerly. So we have to beat in the waterway down through a bridge till we have passed Strynø. The ferry to Marstal overtakes us and on her way back we meet her again – naturally both times at the narrowest possible section. But that way there is finally some action on board. 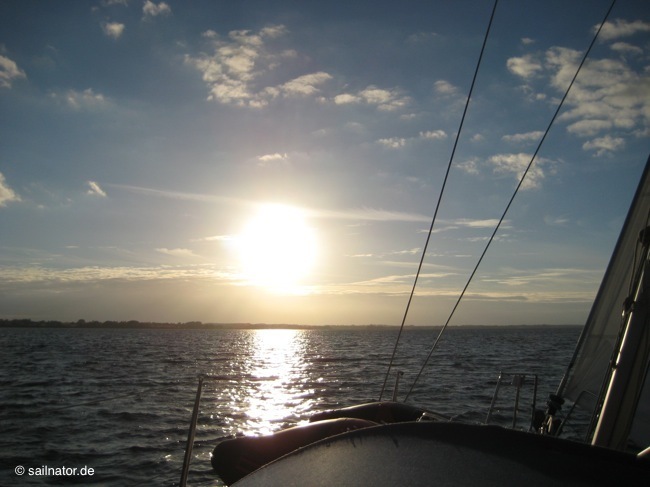 The boys are busy and so we sail beat by beat into the evening sun that stands over the island of Ærø. As we can see the season is getting to its end now. At the guest piers of Marstal only two yachts are moored. It is not easy to find a fitting berth when you have so many choices. Soon it gets dark again and because the pavements of the town look deserted again we cook on board and let the evening fade away in the salon of our yacht. The liquid provisions are consumed. So we have to go to the village after breakfast for shopping. The weather is nice and we can only wear a T-shirt. We ramble through the alleyways and buy some groceries. We visit the fishing port and get hungry. On our way back we look for a place where we can get some Danish sausage (Pølser). But they are all already closed for winter. 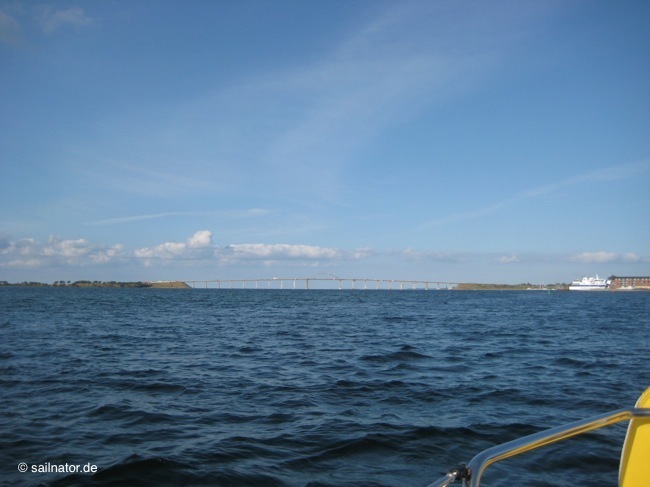 So we decide to stay in the wind shadow of Ærø and follow the waterway to northwest. 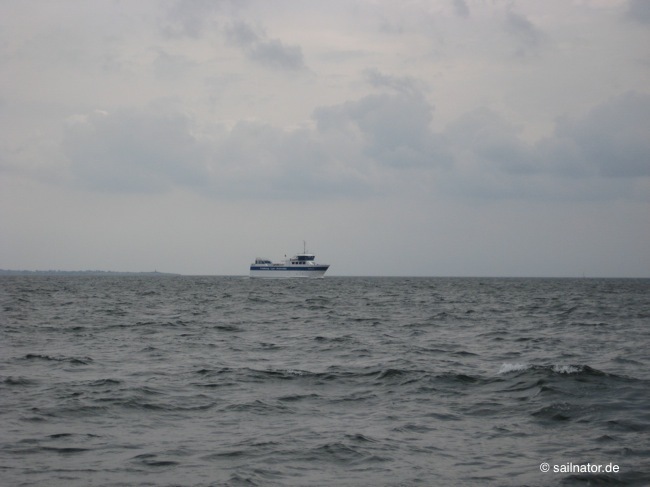 There we want to round the tip of the island and hope that the swell between Als and Ærø is within sailable limits. Shortly after leaving the dock we hoist the jib and let us pull to the landfall buoy where we let the mainsail follow. At the northwest tip of Ærø we have to tack. At this point we get out of the wind cover and have to reef now. We set course on the outer Flensburg Fjord. Meanwhile the sun has gone. It starts to drizzle and it gets cold. The boat pitches through the short steep waves of the Baltic Sea. But as well as hoped they get smaller the closer we get to the island of Als. A Dutch yacht nearby seems to have given up and sails back downwind to the north. Now the skipper begins to doubt if the wind indicator is showing us the right wind force. 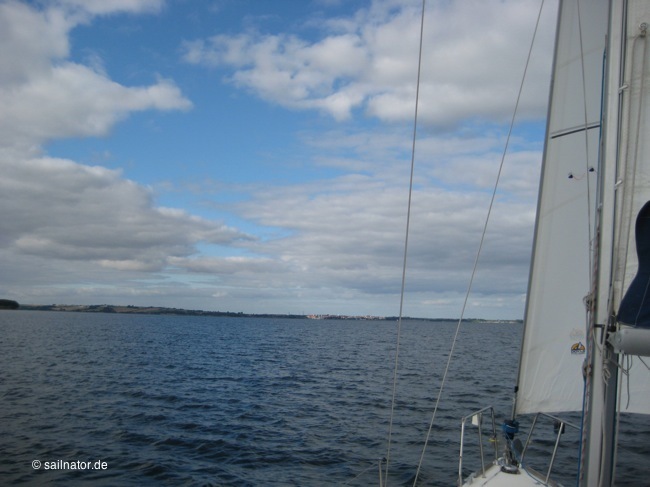 We try not to lose any degrees of height but when we enter the Flensburg Fjord we have to beat to reach our upwind destination. Slowly it gets dark. At least we can go on under full sails again. At about 10:00 p.m. we secure the sails in front of Sonderborg. We have a discussion in which harbour we should go now. The skipper does not want to dock in the marina, because he once got stuck there and we are expecting strong winds for tomorrow. I do not have any kind memories of the sanitary areas in the city harbour. And the distance to them can be far. These arguments convince him and so we go to the marina. At about 10:30 p.m. we are moored in a box but unfortunately it is too short for our boat. The stern extends about 3 feet beyond the posts. Although we are not in the mood to change something we cannot stay here like this in the announced strong winds. So we have to do the manoeuvre again and it takes several attempts till we are safe. But after that we can finally eat something and very exhausted fall into our bunks. We are awoken up by a loud whistling in the shrouds that is caused by the strong wind. Fortunately we fixed the halyard properly yesterday so it did not beat against the mast the whole night. The skipper is worried because he definitely has to go home tomorrow. Because of that today’s destination is already Flensburg even though the charter week actually ends on Friday. The weather forecast promises a short weather window with 5 wind forces in the late afternoon. That should be enough to reach our homeport. If it does really turn out that way. Over breakfast we talk about the manoeuvre that should help us out the box in strong side wind. But we are not really sure about it and just want to wait and decide later. We first got to the town. The sun comes out and the main street is full of people. After shopping we still have some time to rest in one of the street cafés. Between all the houses we do not feel the strong wind. But when we return to the marina we come just in time to help a small yacht berthing. The crew missed the planned box and now they are on the opposite side with their arms clasped around a post. Their prospective neighbours are already on their way to pass them lines and to fender their own boats. With combined efforts we can moor the boat and then again we worry how we shall leave the dock later. As announced the wind decreases a bit in the afternoon. With a lot of momentum and some luck we get out of the box at about 04:00 p.m. without drift off. 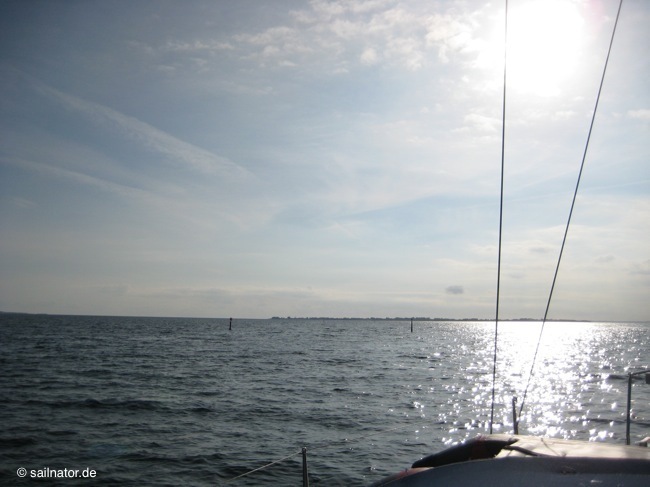 We beat up the Flensburg Fjord with second reef and the jib half furled. Once trimmed properly the yacht withstands the strong wind very well and is easy to steer. The boys want to sail under full sails to really get the boat up to speed, but for old men like us this is enough. The view up to the sky does not bode well. We just pass the small harbour of Langballigau when the yachts of the local club come out for the Wednesday regatta. The sky darkens and a big cloud is moving overhead. Strong squalls come down to us. In shortest time an awkward swell builds up and white stripes of foam are drawn across the water. The boat heels but we can quickly catch it. The regatta yachts that are already out of the marina dance on the wave crests. Some of them are heaving-to. In the harbour entrance it narrows and we beat through all of them. The water sometimes gets quite close to the winches and the boys are excited. Again some gusts hit us, but suddenly this horrific episode is over. Now sailing really gets fun while the sun comes out. The wind is still strong but behind Cape Holnis there is no swell anymore. 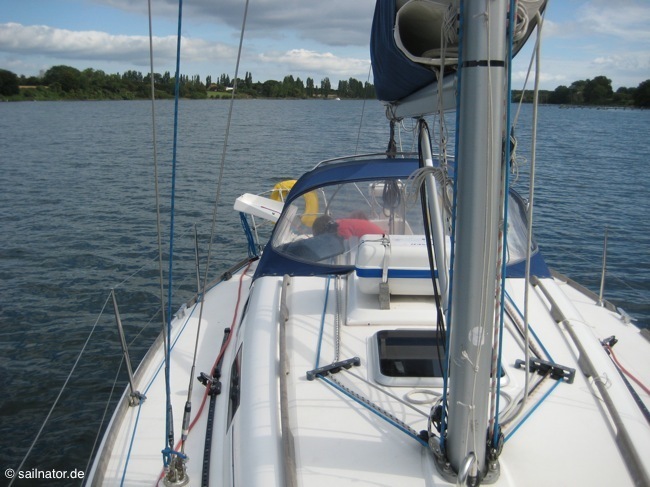 The big steering wheel lies well in the hand and the rudder easily follows the instructions of the helmsman. But fortunately time passes way too fast. 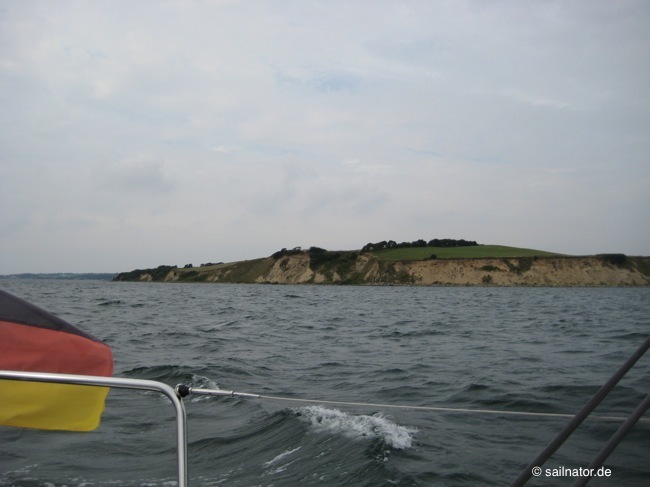 Soon the cape is rounded and we rush along the inner Flensburg Fjord. 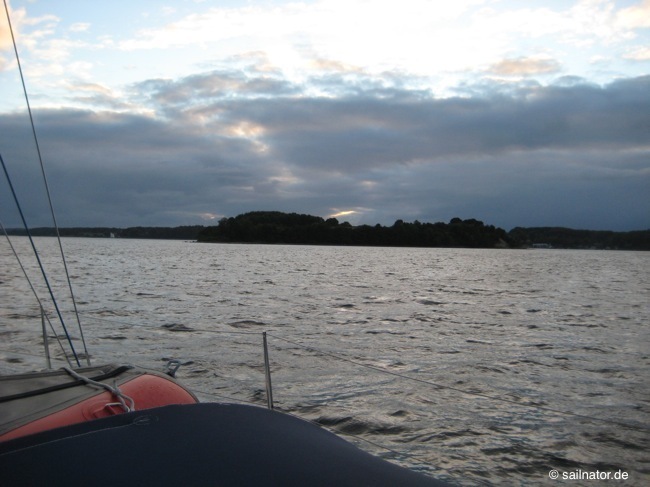 When we secure the sails in front of our homeport Sonwik it is already 08:30 p.m. and almost dark. We berth at the floating jetty and do not want to believe that our wonderful trip is already over. Our neighbour comes over for a small talk. He tells us that he measured 9 wind forces in the afternoon. Well. We did not see flying water. But even when we subtract 2 wind forces of his story as sailor’s yam our wind indicator must be broken. In the morning the charter company sends somebody to check the boat. Again everything works quickly and professionally. The boat was in very good condition in spite of her advancing years. (Only the wind indicator seemed to be manipulated by somebody.) It was great fun to sail her. We had a wonderful trip in a beautiful area. The marina Sonwik was a very good starting point for it.